WHAT DOES THE FLATSHIFTER BLIP KIT KIT DO ??? Put simply it enables you to do clutchless downshifts without using the clutch. (clutchless downshifts only) can be added to your current make of quick shifter. NEW NEW! unique H pattern gearbox clutchless downshifts now possible( WORLD FIRST) !!!! see video Lotus Elise GT Widebody – Honda iVTEC K24 / Blipshift Test below. The Flatshifter ‘Blip’ is a stand-alone clutchless downshift (rev matching) ONLY system that is based on the race-proven Flatshifter Expert clutchless up & down gear shifting system and is intended for use with vehicles that already have an ECU based ignition or fuel cut up-shifting functions, or do not want to use a clutchless up-shift system. The ‘Blip’ system literally blips the throttle for you when downshifting using exactly the right amount at exactly the right moment (every time) using a unique patented rev matching system, no more very difficult heel & toeing required. Works with engine management systems such as Power Commanders and all types of OEM and aftermarket engine ECU’s and quick-shifter systems. 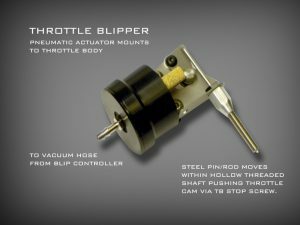 The Blip system features a patented engine vacuum powered and self-regulated throttle blipper with a graduated lockable blip level adjustment. Please click on video link below to see a video of blip kit in action, only takes about 30 seconds but well worth the wait. The Flatshifter Blip will operate with all types of sequential gearboxes including but not limited to Quaife, Hewland, Sadev, and Elite, Drenth type dog gearboxes, as well as most motorcycles & bike, engined vehicles. It is suitable for road or race applications and as an invaluable aid for disabled drivers/riders and racers. 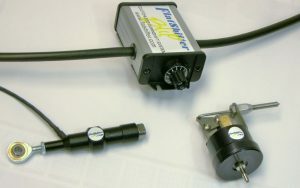 The system can be supplied with a gear linkage gear shift sensor or a strain gauge gear knob sensor (see shift kit) and can also be used in conjunction with the Flatshifter Max electric paddle gear shifter system. Automatic self-regulating throttle blip control. Allows you time to left foot brake. Works alongside all engine ecu. All Flatshifter products are repairable, most of our competitors products are made in China etc and are totally sealed so that when you get a problem after the warranty has expired you have to Throw it away and pay for another unit, All FLATSHIFTER clutchless shifting products are repairable so in the unlikely event of a problem after the 12 month guarantee has expired you can return the unit to us for any repairs. FLATSHIFTER ‘BLIP’ ONLY £725.00 GBP + vat (vat EU countries only) and postage. We ship to all countries on a regular basis including the USA, Australia, Canada, NZ, All of Europe, Guernsey, Malta, Japan, Scandinavia, Norway, Sweden, Poland, etc etc. NEW DEALERS / DISTRIBUTORS WANTED FOR THE UNIQUE FLATSHIFTER RANGE OF PRODUCTS.